Following the footsteps of Sudoku and Kakuro, Hitori are yet another type of easy to learn addictive logic puzzle which was invented in Japan. Using pure logic and requiring no math to solve, these fascinating puzzles offer endless fun and intellectual entertainment to puzzle fans of all skills and ages. Hitori is a number-elimination puzzle. 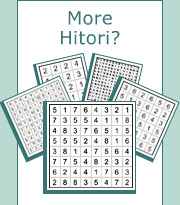 Unlike Sudoku and Kakuro, Hitori puzzles start with all the numbers in the grid and your task is to eliminate some of them according to the rules. If you like Sudoku, Kakuro and other logic puzzles, you will love Conceptis Hitori as well!